DAY 4 – Tue 24 Sep – Gibraltar 11pm (Mon?) to 4pm (docked) – a tiny peninsula and outpost of Britain attached to Spain’s Costa del Sol, Gibraltar has played an over-sized part in history thanks to its famous Rock, the massive headland that offers views of the sea, the ocean and two continents. DAY 6 – Thu 26 Sep – Nice (Villefranche), France 8am to 6pm (tendered) – Nice is a cosmopolitan city where you’ll find a colourful Old Town, elegant Belle Epoque architecture, French Riviera chic and much more. The ship anchors just outside city limits, in the deep blue bay of picturesque Villefranche-sur-Mer. DAY 7 – Fri 27 Sep – Rome (Civitavecchia), Italy 7am to 7pm (docked) – From the monuments of the ancient empire to the pursuit of la dolce vita, the Eternal City is an unrivalled open-air museum and a lively modern metropolis. The tiny enclave of Vatican City is home to sacred sites and priceless art. DAY 8 – Sat 28 Sep – Florence/Pisa (Livorno), Italy Livorno 7am to 7pm (docked) – Livorno is your gateway to beauty of Tuscany, including spectacular Florence, birthplace of the Renaissance and a city of priceless cultural treasures, and Pisa, whose landmark tower is a legacy of its days as a medieval maritime power. DAY 9 – Sun 29 Sep – Genoa, Italy 7am to 4pm (docked) – Set between sea and mountains, Genoans built up, with cake-like layers of colourful buildings, winding streets and staircases that form Europe’s largest medieval centre. You can also visit the scenic towns of the Italian Riviera from here. 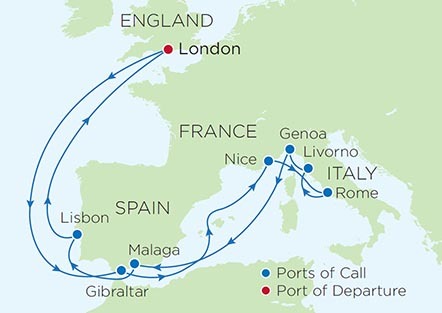 DAY 11 – Tue 1 Oct – Malaga, Spain 10am to 4pm (docked) – The lively capital of Costa del Sol is an eclectic mix of historic and modern like Moorish palaces, a Renaissance cathedral and cool tapas bars. Visit great and chic seaside towns or travel inland to Grenada and the famous Alhambra complex. DAY 12 – Wed 2 Oct – Lisbon, Portugal 12 noon? to 7.30pm (docked) – The discoveries of early explorers made a small kingdom a world power and its capital a wealthy city. Your explorations in Lisbon can include the village-like Alfama district, churches, castles and elegant 18th-century squares.